This out teachers lounge and kitchen. Teachers are a key part of our school, so we took the time to design a beautiful rest area for them. Working with children takes concentration, attention to detail and considerable stamina, so we feel that teachers must have a tranquil area to rest and relax. This is our way of saying thanks to our valued teachers. There are lounge chairs to take a nap, a dining table to eat, a kitchen to prepare their lunch and a refrigerator to keep all cool drinks and perishable foods. 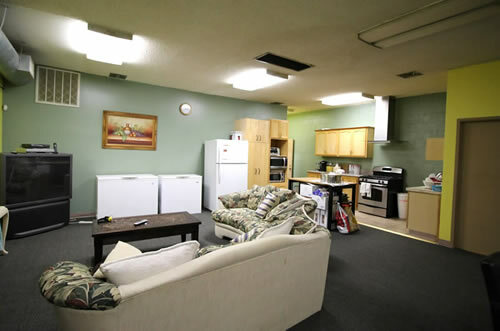 The teachers lounge is also our training area. We make extensive use of the lounge for presentations to train our teachers with new resources. A computer with high speed internet access allows teachers to research special projects and catch up on their e-mail during their rest time. We have also installed separate printer systems including a high speed color printer system for the teachers to print class projects.